I started my Neptune speaker project over ten years ago with a fully active three-way crossover system, mostly because I had no experience of designing passive crossover filters. I felt much more comfortable with op-amp circuits, where filters can be cascaded in a mathematically straightforward way to give an overall flat transfer function, and tweaks to the reponse (such as compensation for the baffle step) are easy to add. Two-way passive filters are relatively easy to design, providing the crossover frequency is well within the passband of the drivers and the load impedance is acceptably constant, but a three-way passive crossover is much more tricky, as the filters for the two transitions interact in a complex way (particularly so if the two crossover frequencies are relatively close together). After a while, I designed and installed a passive filter between midrange and treble, including impedance compensation for both drivers. This both measured and worked well, and certainly reduced the amount of noise (mostly hiss) which had been audible through the midrange and treble drivers with the full active system. Over the years I have built and used a whole series of active circuits for the bass-midrange transition at 550Hz, finally ending up with a differential active crossover with valve and MOSFET buffers, which sounded rather more transparent and listenable than its op-amp-based predecessors. The consensus is that converting loudspeakers from using a passive (non-powered) crossover circuit to an active crossover has the potential to seriously improve the sound quality. Two reasons are normally given for this: firstly, the bass drive unit is directly connected to the amplifier output, instead of through one or more inductors (which may have resistances of an ohm or more); and secondly it is much easier to optimise the frequency response with an active system. I got some very musically satisfying sounds from my speakers with the latest active crossover. So why have I decided, after ten years of mostly happy listening through my three-way Neptune speakers, to go the other way? Power dissipation and room temperature. 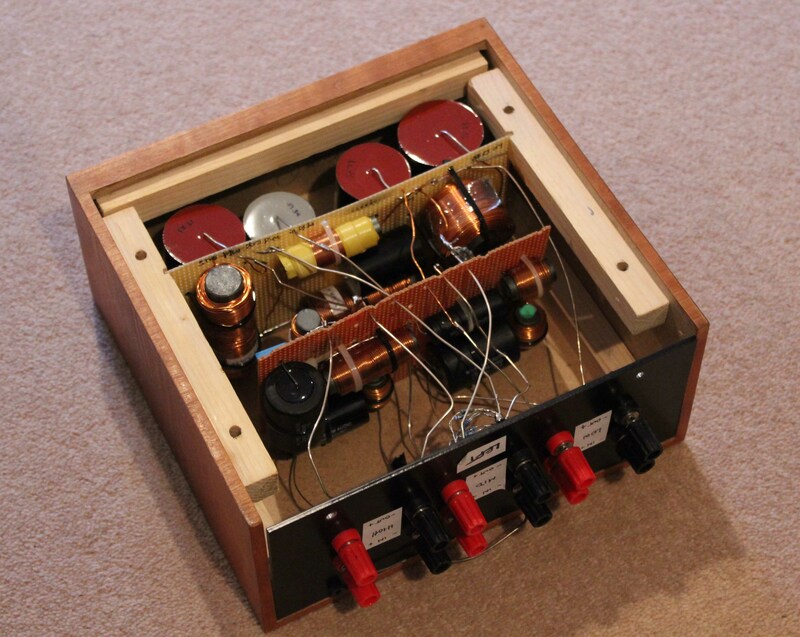 My latest crossover has fourteen 6922 dual triode valves in it, as well as a pair of shunt regulator boards, all of which heat up the room, and in particular the underside of the shelf above them. The output stage of the Stochino solid-state amplifier that drives the bass also dissipates over 60W while idle. In winter this warms the living room up appreciably; with summer approaching I expect it to get uncomfortably warm, especially now I am using my 300B monoblocs. With power bills increasing rapidly, toasty room temperatures aren't the only issue, either, never mind my green conscience. Noise. The mains transformers in the power supply box shared between the active crossover and my RTP3 preamplifier hum audibly, and halving this number would reduce vibration levels. On top of this, there is a slight buzz through the speakers that I have never managed to eliminate, possibly due to earthing issues in the crossover (the preamp and power amplifiers are themselves very quiet). Using medium-to-high sensitivity loudspeakers with valve electronics, noise is never going to be completely eliminated, and passive crossovers do help reduce the levels passed to the speakers. Too many boxes and too much wire. My system shelves are crammed with boxes, with a viper's nest of wires behind them, and removing the solid state power amplifier and active crossover would remove two boxes and a commensurate amount of cable. Simplicity. Despite the profusion of valves in my preamp and power amplifiers, their circuits are essentially very simple. Adding complex filter circuitry can only get in the way of the transparency of the system. Reliability. Although my RTP3 preamp, which uses similar circuits to my latest crossover, has worked near-faultlessly since I finished building it, I have had several problems with the active crossover. The latest of these is a DC offset on the left-hand low-pass output that appears about a hour after switch-on, which in turn triggers the speaker protection in the power amp. I eventually gave up trying to solve this frustratingly intermittent fault, which made listening to music rather stressful, and resorted to re-installing my old crossover, resulting unfortunately in noticeable reduction in transparency, presence and listenablility. On a more general note, the more active circuits there are in my system, the more chance something is going to go wrong in the longer term. Curiosity. My 100W Stochino amplifier has done good service for many years driving the woofers, but I didn't actually enjoy listening to them much in the long term when they were driving my ProAc Studio Ones full range. At the moment my lovely new 300B amplifiers only drive the mid and treble: I spent a lot of money on the Sowter output transformers, and I would love to hear what they sound like driving "normal", full-range speakers! I apologise in advance for the length and the abundant detail of my design process in this article, but I wrote it partly for my own reference, and I have a belief that learning from the mistakes of others is much quicker (and almost as useful) as learning from one's own mistakes. There are plenty of online calculators on the Web for passive crossovers which all use pretty much the same equations to produce component values for passive crossovers. These are, unfortunately, not much use by themselves, since they assume that the speaker drivers they feed have an electrical impedance that looks like a resistor (in other words, does not vary with frequency), and that the frequency responses of the drivers are flat over the frequency range where the filters pass a signal. No driver I have come across behaves like this. So, we need to do some work. There is more than one way to design a crossover. At one extreme, there is the theoretical and scientific approach, exemplified by Rod Elliot's excellent and methodical summary of the issues involved. At the other end of the spectrum, here is an account by Lynn Olsen of how he designed the crossover for his popular Ariel speakers: Lynn definitely knows what he is doing, but he starts with a minimalist setup and then tweaks the filters towards what sounds good to him and then finally explains why the end result works. When I started this project, I could do electrical measurements, but I didn't have the facility for proper acoustic measurement. What I am good at is modelling: I am an ocean modeller in my day job, so I am very familiar with numerical models of real processes, and in particular I understand how to optimise numerical systems through parameter ensembles. There are convenient and flexible commercial packages such as Matlab which are designed for this kind of thing, but as usual I went back to good old-fashioned FORTRAN programs to do the job. I already have a working passive crossover for the mid-treble crossover, so I would prefer to have to replace as few as possible of the components in this. The original had a fourth-order Linkwitz-Riley filter centred at 3380Hz, which I selected initially to be appropriate for the passbands of the drivers, and then changed slightly to give more practical values for the crossover parts. The HM100Z0 is a small driver with a stiff suspension and a resonance frequency of 250-300Hz. For this reason the bass-mid transition has to be at a relatively high frequency, even if we are using a fourth-order filter: I started with 400Hz in the active crossover, but after a while decided to raise it to 550Hz to reduce distortion. I had no reason to suspect that there was any problem with 400Hz, so this lower transition frequency is not set in stone. The first target for the passive filter is to reproduce as closely as possible the fourth-order Linkwitz-Riley transfer function of the original. I expected to have to make some adjustment to compensate for the rolloff of the HM100Z0 at and below its resonance at around 300Hz, but the low-pass for the bass driver should be not too far off the textbook alignment. With the active filters, I found that I needed to add compensation for the baffle step: a 3dB boost at low frequencies with a transition at 450Hz worked well, though I never measured this in the room. Let's start with a crossover circuit like the one shown at the right. If we assume that the speaker drivers are resistive loads, we can use analytical expressions to find the ideal values for the components in the low-pass and high-pass filters at top and bottom. The bandpass filter for the midrange, though, is more tricky, and there is no exact expression for the components in the circuit. In fact the problem gets worse the closer the two crossover frequencies are: with the original crossover of the Neptune the separation was between 550 Hz and 3380Hz: a factor of 6.1, or only about two and a half octaves. There are useful online calculators for three-way all-pass filters (for example here). I gave up trying to tweak the component values to get an acceptable bandpass response with the transition frequencies so close together, so I lowered the bass-mid crossover to 422Hz, which is exactly three octaves below the existing upper crossover frequency at 3.38kHz. Calculating the responses (left) confirms the accuracy of the online calculator: the dotted lines are the theoretical reponses for a three-way Linkwitz Riley transfer function, and the solid ones are the actual calculated responses for the given component values: the two sets agree to better than 0.2 dB. Note that these curves are normalised for identical unity maximum transfer response for all three of the drivers. This also gives component values for the midrange high-pass and the tweeter low-pass that are reassuringly similar to the ones I have in the original Neptune crossover. As an interesting point, if we deliberately under- or over-load the bandpass filter for the midrange, the mid response becomes more or less peaked in the centre of the passband. 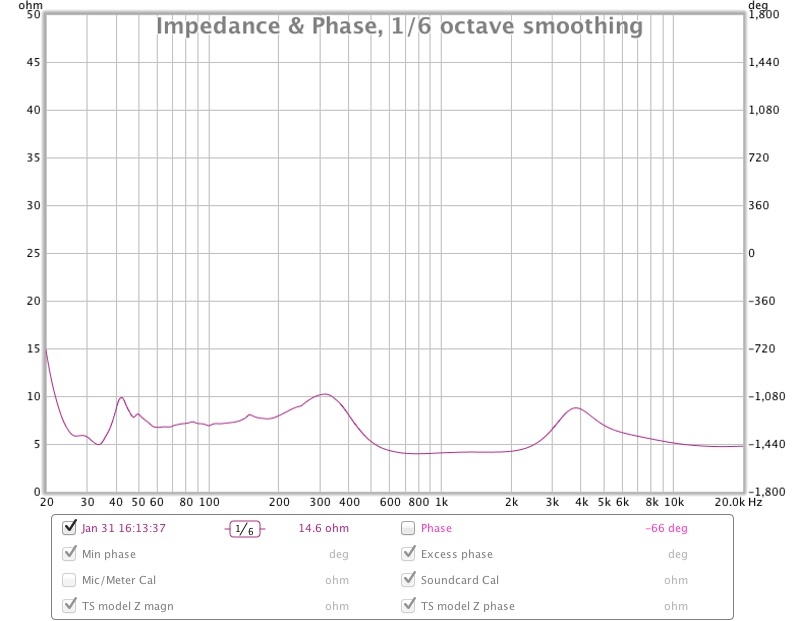 Here is an example of what happens: terminating with an impedance 7.5% too low results in dips of about a decibel on each side of the midrange, which 7.5% too high an impedance gives peaks of about the same size. Compensating for the baffle step is rather more difficult in a passive system, as we can't just add an extra op-amp circuit to modify the frequency response in an easily predictable way, as I did with the original active setup. In particular, we can't add a boost of, say, 3dB in a passive circuit. This will entail a change to the filter responses from the ideal ones, which is rather trickier to achieve with passive circuits than with an active crossover, where I simply added a filter network around an extra op-amp in the original, and across the output of the input buffer in the latest hybrid implementation. However, if we have already decided to reduce the midrange level (the HM100Z0 was attenuated by 4dB in the passive crossover), it is possible to alter the reponse of the mid and bass drivers to simulate the baffle step. I wrote an optimisation program to tweak the textbook component values for the bass driver. 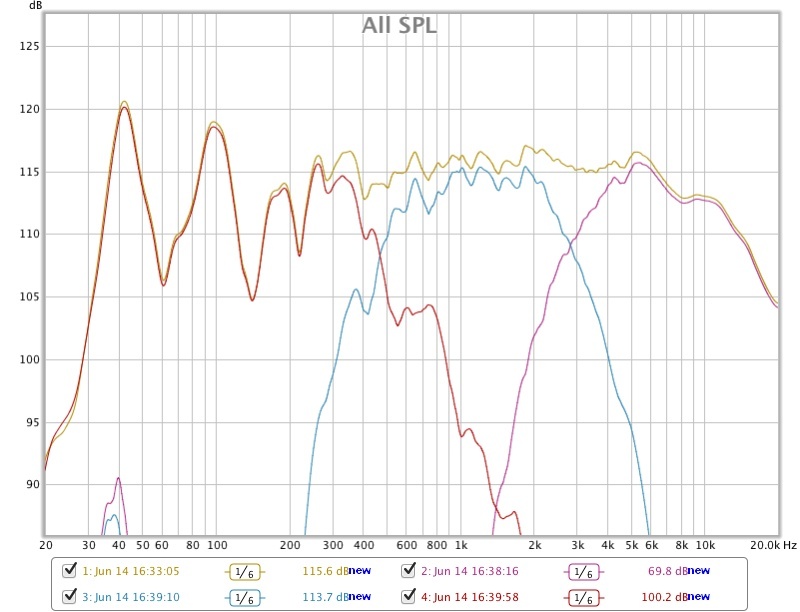 After adjusting the relative sensitivities of the three drivers, the agreement between theoretical and actual results (see right) is a little worse than with no baffle step correction, particularly in the 100-300Hz upper bass region, but the curves are still within half a decibel or so. The midrange, crucially, is pretty close to our target, and the important thing is that we have confirmed that it is possible to simulate a broad rise of about 3dB below 450Hz. I should stress, however, that these filter responses are spurious in the sense that I am ignoring the driver sensitivities: I am assuming that I can adjust the amplitude of each driver arbitrarily. In practice this is unlikely to be the case, as I am attenuating the midrange driver to match the treble level, but can't boost the bass. It turned out in the end that the reduced output from the woofer below 400 Hz negated the effect of the passive baffle step compensation. The next step is to adjust for the non-uniform frequency responses of the drivers: the midrange and treble units are pretty close to being flat in the middle of their passbands, but the HM100Z0 midrange has a rapid falloff below 400Hz, and the response of the woofer rises steadily by about 4dB from 100Hz to 1500Hz. The actual and modelled frequency responses are shown at upper right, with the amplitudes chosen to fit the supplied curves (dashed lines). The frequencies and low-pass Q values are reassuringly consistent with the ones given in the datasheets. The actual responses are of course much more ragged than the models, and the Q values are pretty underconstrained by the data, but I am pleased with the models and they are good enough for our present purpose. One thing that jumped out at me at this stage was how much lower the response of the HM210Z0 was at the bass-mid crossover point: the sensitivity figure of 91 dB/1m/W is only representative above a kilohertz or so, and the sensitivity at 100 Hz is a good couple of dB lower. When the modelled responses are then used instead of the ideal constant response, we get a 1 dB bump in the lower midrange (the grey trace in the plot at left), which comes from a combination of the rising response of the HM210Z0, and a slight peak in the low-frequency response of the HM100Z0. It is interesting to notice that the changes in parameters between iterations are only a couple of percent or so. You could say that these changes are not significant compared with the discrepancies between the modelled and actual frequency responses of the drivers, but the filter parameters will affect the reponse over a fairly wide frequency range, and so are likely to be important. This does mean that we will need to select the parts closely once we have decided on the networks we will use, and in particular this underlines the need to match values between channels to 1% or better. I always start with the most-accurate inductance compensation for every driver, extending it well beyond the audio band. Back at Audionics, I once designed a speaker with a flat impedance curve out to 1 MHz, just for grins - it only took 4 extra parts, so why not? The Audionics CC-2 had plenty of phase margin, but very few other amplifiers did, and these sounded less stressed and more natural with a resistive load in the 70 to 300 kHz range. It was easy enough to do an A/B test (flip a switch for the two RC networks), and the flat-impedance version sounded better with the competing amplifiers. On the CC-2, it made no difference. I also like to decouple the passive filter elements as much as possible from the assorted reactances of the driver, which at a minimum, means Zobel inductance compensation, as well as sneaking in a parallel R to flatten out any other little bumps. I've been doing this with tweeters going back the Seventies; they always sound better (to me) when some attempt is made to decouple the filter from the driver. I've tried the doing-the-most-with-the-fewest-parts optimizations, and it sounds worse to me, regardless of measurements or simulations. I prefer a decouping/isolation circuit on the driver-side of the crossover, even it is no more than an RC and another moderately high-value parallel R.
Given that I will be using the speakers with a zero-feedback valve amplifier, Lynn's first recommendation sounds well worthwhile, but for the moment I will concentrate on the second ideal, which is to provide the filter circuits with a load which is independent of frequency. The driver datasheets all provide plots of electrical impedance as a function of frequency, but don't often include the phase of the impedance, which is necessary for calculations of circuit performance. To predict the effect of the complex non-resistive driver electrical impedances on the frequency response, I again resorted to simple models. There is a standard electromechanical model (described clearly in this excellent article by Tomi Engdahl), which represents the fundamental resonance of the suspended driver mass as a parallel resistance Rmod, inductance Lmod and capacitance Cmod, with the voice coil inductance Le and resistance Re in series with this. If the impedance curve of a driver fits the model above, this makes the design process much easier: first of all we can generate a model response of the complex impedance curve of the driver whose magnitude matches the measured one, then we can use this to develop a compensation circuit in a computer model without having to solder and desolder lots of different-valued real components. There is a simple circuit (below right) that, when connected across the driver, equalises the above model circuit to look acceptably like a constant, resistive load. My approach in the end was (a) to model the impedance that I measured, rather than use the supplied curve; (b) find an equalisation circuit that leveled the modelled curve; (c) build the circuit; and (d) finally check again by measuring, tweaking as necessary. I measured the drivers for comparison with the datasheets: although the tweeters matched the Scan-Speak data pretty well, the mids and woofers measured rather differently, so assuming the correctness of the supplied data resulted in incorrect equalisation of the impedance, and hence misterminated filters. In addition, the simple RC model does not match the inductive rise at high frequencies in either mid or bass driver: the impedance of both drivers rises less steeply than the model. The Engdahl article does, however, state that the match in practice is normally poor, with the phase angle at high frequencies tending to a value closer to 45 degrees than the capacitive -90o predicted by the model. I modified the model so that, instead of representing a purely inductive high-frequency responce (Z = iwL), the reponse was Z = RDC[1+i sqrt(wL/R)]. My measurements of the impedance of the HM210Z0 drivers were a good match to the data above about 150Hz, but below that looked rather different, mainly because of the loading by the reflex box: this replaces the free-space resonance at 30Hz with a pair of resonances, the lower one below the frequency limit of my measurements (about 16 Hz) and the upper one at just under 60Hz. The two small peaks at 160Hz and 420Hz are almost certainly related to cavity resonances of the box, since they respond mildly to damping: the lower one corresponds to the length of the box and the higher one to the front-back distance. In any case, these peaks are not amenable to fixing through the crossover, and I will do some further experiments with damping to address at least the upper resonance. I started off assuming that the impedance peak correponding to the fundamental resonance of the woofer wouldn't affect the crossover, since the bass-mid transition at 422Hz is more than ten times higher than the free-space resonance frequency. This turned out to be unjustified, as the series impedance of the crossover network at 100Hz is actually a couple of ohms, and the increasing load impedance at low frequencies raises the response by several dB; indeed without any low-frequency impedance compensation the speakers sounded very boomy. Modelling the resonance proved quite easy, and I found that predictions from the model agreed well overall with the measurements I made - the curves lie close to one another, but the modelled impedance curves don't attempt to include the box resonances. To start with I tried to deal with the driver resonance with only an inductor, since the required capacitance was 345 uF, too high to use my preferred option of film caps, but this still left a peak of 9 ohms at around 70Hz. I then applied the full compensation with 300uF of non-polar electrolytics and 47uF of film caps, together with the chunky 22 mH inductors, and this gave a very nice smooth impedance response and as a result a much less flabby bass. Through the crossover region (250Hz - 800Hz), the HM210Z0 now has an impedance between 6.2 ohms and 6.3 ohms. My measurements these drivers puzzled me: the suspension resonance peaks were at different frequencies from the ones claimed in the Audax datasheet. This can't be explained by the box loading, since their tiny Vas value of under a litre means that the boxes are unlikely to have much effect on them. Even more surprising was the fact that the curves I measured for my two units differed substantially one from the other, with different resonant peaks and slightly different DC resistances. I can only think that this is either something to do with production tolerances or that dust has crept in over a decade of use (this would increase the damping of the resonances, but doesn't really explain the change in frequency). I found that I had to use different component values in the equalisation networks for the two channels. In addition the linearised impedance in the two cases was different, so the parallel resistances in the attenuation circuits had to be calculated case by case. Anyway, I still managed by trial and error to linearise the impedances of both drivers within a percent or so over the range 200-4000 Hz, where the HM100Z0 now has an equalised impedance between 5.55 and 5.65 ohms. The resulting filter transfer function was (very pleasingly) rather close to the one I measured into a 6.75 ohm resistor. A second surprise with the midrange filter was that it turns out to have more than 3 dB of gain in the middle of the passband, which elevates the midrange level relative to that of the tweeter. The speakers did sound quite dull with the 4dB midrange attenuation I used with the semi-active system, and I found I had to reduce their level by another 2dB to -6dB to get an acceptable balance. The original crossovers used a network suggested by Peter Dahl to equalise the resonance peak at 600 Hz. I measured this ten years ago (I have no memory of how I did this, funnily enough!) and noted in my original webpage that this gave an impedance between 4.75 ohms and 5.25 ohms from 1.5 kHz to 10kHz, and my more recent measurements confirm this. Here are the equalised impedance traces of the HM100Z0 and for the HM210Z0. Once I was satisfied with the target impedances, I measured the filter response at the driver terminals of both speakers again, and got the results shown on the right. The response, with deviations from the target response of half a decibel or so, looks pretty good now. The midrange, in particular, is far more acceptable compared with the old response which appears to have the rolloff, both low- and high-pass at too high a frequency. The apparently drooping treble reponse of the old crossover is due to measurement error: I wasn't compensating for the high-frequency fall in sensitivity of my DMM. I am also pleased that the channels are now pretty well balanced, which is arguably more important for good sound than perfect frequency responses. The only feature that concerns me is the peak in both channels of the treble filter at just over 6 kHz: I would guess that there is a resonance, either mechanical or electrical, in the circuit. This will almost certainly have an audible effect, and needs to be fixed. At this stage I decided it was time to buy some parts and start building! I put the new crossover together on a piece of matrix board per channel and just managed to fit it inside the boxes containing the original crossovers, although I had to set the existing mid-high crossover board (with the extra parts for the high-pass filter) on its side to make room. I retained the separate input terminals for the three sections: for the moment my 300B amps only have two output terminals per secondary winding, so I hard-wired the mid and treble inputs together and used separate wires for the bass. I suspect that bi-wiring the inputs has a negligible effect, particularly when there is only a metre of wire between amplifier and crossover, but it does make tweaking easier. The result is more crowded than a lot of people would consider good practice, but I did my best to ensure all nearby inductors were at right angles to one another to reduce interactions. At some point I might consider rebuilding the filters in rather larger enclosures, but I rather like the way the existing boxes look, and I have other priorities in the near future. I used SCR metallised polypropylene capacitors almost throughout, apart from the 320uF in the compensation network for the woofers, which I made up with three 100uF non-polar electrolytics and a 22uF polypropylene. These are a mixture of 250V and 630V parts: the first batch I ordered was of the 22uF and 33uF caps in the higher voltage rating, but I quickly realised that the circuit wouldn't fit in the box if I used this rating for the 47uF and 68uF caps. To start with, all the resistors in the crossover are 0.6W metal films, paralleled in bunches of between seven and ten to give the desired value at a reasonable overall power rating. This makes tweaking cheap and easy, but I plan to replace them in due course with Mills or similar quality higher power resistors once I am happy with the sound. The inductors are ferrite cored, sourced from Ivan Leslie at IPL Acoustics. It may well be that air-cored or high-quality iron-core inductors offer less distortion, but the former will have higher DC resistance for a given inductance value and are much larger, while the latter are much more expensive. I measured the IPL inductors, and they are very close to their required inductance values. I put the midrange and treble impedance equalisation networks in the speaker cabinets, as they wouldn't fit in the crossover boxes. The woofer equalisation circuits, with their big inductors, wouldn't fit anywhere, so they stay on the shelf behind the crossovers. I originally assumed that the similar sensitivities of the three drivers in this design meant that at least to two HDA drivers were well matched. With the original semi-active arrangement I used a mild passive attenuation of 3-4dB on the midrange to match the tweeter, and adjusted the bass level through the level control on the active crossover. I found that I had to raise the bass level a little to get a balanced sound, which on further examination of the datasheet for the HM210Z0 makes sense: the quoted sensitivity of 92dB @1W @1m only holds above 500Hz, while at 200Hz and below it is less than 90dB, resulting in relatively reduced low and mid bass. In the Neptune speakers the bass-mid crossover is at 422Hz, so any benefit from the high midrange sensitivity is wasted. The combination of the high sensitivity of the HM100Z0 midrange driver and the 3dB or so of resonant gain of the passive bandpass filter means that the mid needs to be attenuated by a few more dB. With the all-passive crossover, I started off with 6dB of loss, but after a while found that this sounded a little dull, so I changed to 7dB. Calculation of the resistor values for the attenuator circuit needs to take into account the impedance of the equalised midrange driver (close to 4.25 ohms) and the load impedance of 6.75 ohms that the crossover filter is designed for. The table of values is as below. When I first replaced the existing crossovers with the new passive circuits, before I had spent much time on impedance correction or on tweaking the midrange level, I was surprised by the sound of the system. I expected it to sound at least bearable, and also I had an expectation of a more open, easy-going sound, and both of these were true. Listening to a current favourite of ours on CD, Diana Krall's Quiet Nights, the soundscape detached itself from the speakers altogether, and in fact seemed to be a little recessed behind them. What did take me aback was the fact that the sound didn't come across as bass-light at all, despite my noting the low sensitivity of the HM210Z0 driver at frequencies below 400 Hz: there was in fact a slight boominess in the bass, which started to get a little tiresome after a while. The bass boom is chiefly due to the low-frequency impedance rise I mentioned earlier: with the LCR compensation network across each woofer terminal, the low-frequency bloat all but disappeared. The relative bass level in the new system is higher than it was before, but I find this much more bearable than when I was using the active crossover and the Stochino amplifier - I used to find I was turning the level of the low-pass section to its minimum setting of about -6 or -5dB, as otherwise the system produced quite a muddy sound when turned up. The quality of the bass, however, is remarkably different from what I was used to hearing through the old crossover and the solid-state amplifier. The bass now has a real physicality and bloom, which I certainly didn't get before, and the music is now very vital and enjoyable. I put on an LP of Oscar Peterson's The Trio, and found myself enjoying it very much: Niels Pedersen's acoustic bass was very well defined and funky, Joe Pass's guitar sounded natural and sweet, and every note from Oscar's piano was clear. My main complaint about the speakers right now is a lack of sparkle, high-frequency texture and detail, which is consistent with the relatively high midrange level I noted in the measurements, as well as the elevated bass levels. Franz Schmidt's Symphony No. 2 (Neeme Jarvi, with the Chicago SO) was nicely natural and dynamic, with biting horns and powerful tutti, but the violins were lacking in presence and incisiveness. After a couple of weeks, I temporarily restored the active crossover, as the excessive bass level was starting to become a little too obvious, even with the impedance compensation circuit in place. I made some direct measurements of the impedance of the woofer in the cabinet, at 1/12 octave resolution, to see whether the resonance was acoustic, rather than an electrical resonance in the new crossover circuit. Comparing my measured impedance with the data from Audax (left) is revealing. The disparity between manufacturer's data and measurements below 100Hz is of course due to the reflex loading of the driver in the box, where the curves on the data sheet are for the drivers mounted on a baffle. At higher frequencies, though, the differences get more interestintg. Although the impedance between 100Hz and 550Hz is generally very close to the supplied data, the peak at 230 Hz is indeed prominent, with a rise of about 3 ohms, and is pretty undamped, with a width of less than 30 Hz. This is larger than the contribution at 100 Hz of the low-frequency impedance rise, and is without a doubt the cause of the peak in the electrical response of the crossover circuit. The second, broader, peak at 425 Hz is more of a puzzle: this frequency has a half-wavelength of 40 cm, which may be either a resonance between the front and back walls of the cabinet or a subsidiary resonance along the vertical axis of the box. Its effect on the crossover response is is likely to be less than that of the one at 230 Hz, since this is in the middle of the crossover region, but nevertheless it ought to be treated. I posted a thread to the DiyAudio forum, and here are the replies. In an attempt to tackle the acoustic resonances, I added some extra partial horizontal shelves (6mm plywood, with carpet underlay) at two different heights in the box. This largely removed the peak at 240Hz. I took a lot of time equalising the midrange impedance, since this turned out to be very well simulated by the computer model, and as a result the effect of a given impedance network was easy to predict. The reward of all this work was that the impedance of the HM100Z0 with the final optimised network across it varied by less than 1% over the passband. Even better, the measured bandpass filter response measured almost perfectly. The feedback-free 300B amplifier will perform much better if the load on its outputs is relatively high, and doesn't vary too much with frequency, otherwise the output reponse too will be frequency-dependent. I expect my amplifier to have an output impedance of up to 2 ohms on the 8-ohm outputs; by contrast, a normal solid-state amplifier with lots of negative feedback will have an output impedance of a fraction of an ohm. I ran Room Equalisation Wizard (REW) in impedance mode to measure the system impedance of one of the speakers, as well as the impedance of the drivers separately. I also thought it would be interesting to measure the bass drivers with and without the impedance correction described above, as an extra check on the measurements I made earlier with a multimeter. The measured system impedance can additionally be compared with the impedance predicted by the program I used to model the driver impedances. The results are shown on the right. The measurement turns out to agree quite well with the model. 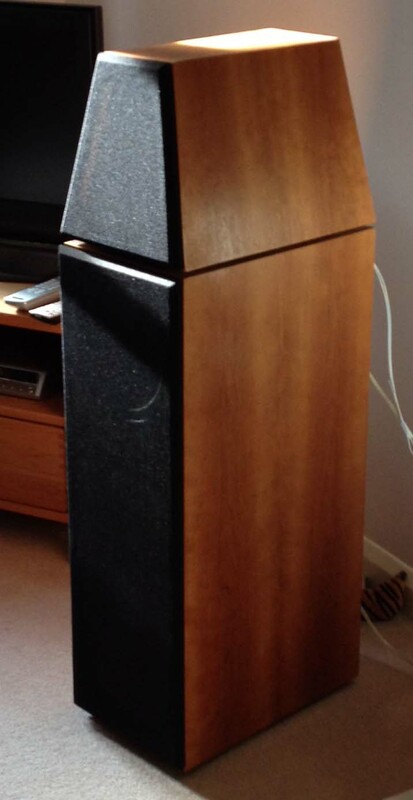 If it weren't for the rather low dip in the midrange to about 4 ohms, the system would qualify as a 6-8 ohm speaker. I have considered rebuilding the midrange attenuation network to increase its impedance by 50%, and adjust the inductors and capacitors in the bandpass filter accordingly: this would ease the load on the amplifier. The downward slope above 5kHz is most likely a result of the impedance linearisation for the tweeter, but it shouldn't give an amplifier much trouble. In the months since my last listening sessions, I have put a lot of work into impedance compensation: the most significant changes being straightening out the midrange impedance (which is now pretty close to ideal) and reducing the bass impedance hump at just under 60Hz to less than 6.7 ohms. This was with a total midrange attenuation is -6dB. These adjustments brought the mid and treble into much better subjective balance, and the impression that the system was lacking sparkle has reduced, even if not completely gone. There were definite audible improvements from reducing the size of the impedance peak of the woofer at its in-box resonance frequency. I am convinced that the biggest problem with my system now is the room, with lightweight walls and a resonant suspended floor, as well as the speakers having to stand only ten centimetres from the back wall. The effect of this is to make good-quality bass response impossible. Although this made the effects of improvements in the mid-bass region a little unclear, I am convinced that the bass overall is more even and is certainly less boomy. I am now pleased with the sound of my system, and feel it has far surpassed the level of subjective performance I got with the differential active crossover (although the latter would certainly have sounded still better with the more recent tweaks to the midrange impedance and relative driver levels). Overall the sound is much more natural than with the active crossover. The first aspect of this is the low levels of listening fatigue, which encourages longer listening sessions. The second improvement is in the soundstage: this is not at all spectacular, chiefly because of the restrictions from the room, but in general the performers sit easily between the speakers while giving an almost subconscious impression of an acoustic space behind them: with the old crossover and solid-state bass amplifier, by contrast, the images were more impressed on a plane centred on the speakers. In particular, live concerts on BBC Radio Three are now quite strking in the immediacy of the performances and the acoustic background. What I notice is a startling density of image and texture in all of these recordings that I have never heard before, as well as a hugely improved ability to disctinguish the character of each instrument and voice in the mix. As an example of this is Paul Tortelier's wonderful Bach Cello Suites on vinyl, which really draws me in - this profound, soulful and elegant music hardly even needs stereo, but I became really aware of the performer and his sonorous instrument blossoming out into the room. Listening to some Seventies multi-tracked rock LPs showed how much correcting the tonal balance of the speakers and getting rid of so much circuitry in the system has enhanced its resolving power. One track on Spectral Mornings by Steve Hackett, an album that I know very well, The Virgin and the Gypsy, is a rather lovely pastiche of folk-rock in the style of the Incredible String Band and others, and the flutes and guitars were very vivid and real (though I still have no idea what this song is supposed to be about!). On Roy Harper's uncharacteristically mellow Valentine, Harper's habit of double-tracking his own voice gives a slightly spaced-out (and occasionally slightly sinister) feel to many of the songs, but I can hear both voices very clearly now, as well as appreciating even more his very original and underestimated talent as a guitarist. On the other hand, I wasn't quite as convinced by my pressing of Led Zeppelin's iconic fourth album, which contains some real classic rockers. The quieter tracks came over very well: the folky Going to California is mixed very intimately, with a big acoustic guitar on each side, and Robert Plant's voice is closely miked and very tangible halfway between the speakers. Four Sticks has some subtle percussion set further back in the mix and Plant's voice is relatively restrained and recessed, with the guitar sounding quite heavily processed. When the Levee Breaks has a legendary drum sound, with John Bonham's bass drum apparently having been recorded in a stairwell, but they lost some impact on my system. Although all the elements in the mix were present and correct, I wasn't totally convinced that this worked as a rock recording. This impression holds for other rock LPs, which sound clear and energetic though headphones, but a little heavy and slow through the speakers. I am not quite content yet with the sound of orchestral strings through the speakers either: with the right recording, these bloom and swell very nicely, but I don't get the sheen, presence and beauty that I have heard from real instruments, and in general I don't feel the system is as detailed or as transparent in the treble as it could be. I did do some measurements with my tweaked RS analogue SPL meter, but was never really confident that the results were reliable, since this is known to have some substantial response anomalies, and indeed the curves I did get were not really believable. Recently, though, I finally bought a Behringer ECM8000 microphone, allowing me to make some good quality acoustic measurements via my E-MU 0202 two-way USB DAC and using Room Equalisation Wizard, installed on my MacBook Air. I taped the Behringer mic onto a camera stand on the midrange axis at about a metre from the front baffle, and took some acoustic measurements (see right). The most pleasing thing is the fact that the transitions between bass, midrange and treble are very smooth, and that my empirical tweaking ended up producing a well-balanced response from 250 Hz up to 5 kHz. This is consistent with my subjective impression of a naturally balanced sound. The other positive result is the way the crossovers work just as I meant them to: at the crossover points each driver is almost exactly 6dB down, which confirms that they are well matched in phase. This, I think, is mainly a consequence of using the drivers well within their natural frequency range, avoiding the phase changes outside these ranges, but also of all the work I put into linearising the driver impedances across the crossover points so that the filters work into something very close to a resistive load. The dropoff of the treble above 6 kHz is most likely a result of the sloping baffle of the boxes containing the midrange and treble drivers: this results in the axis of the tweeter being 20-30 degrees above the listening axis, and this is not inconsistent with the off-axis response plot in the Scan-Speak datasheet. To check that there was nothing wrong with the tweeters or the filter circuitry, I made a near-field measurement of the D2905-9300 on axis at a distance of around 10 cm, and the resulting response looked a lot more like the rather flat one in the datasheet. The slightly weak bass below about 250Hz is partly due to the falling response of the HM210Z0, and partly because the high sensitivity of the midrange driver means that I couldn't properly impement baffle step compensation for the bass (where I did include this with the active crossover). The large wiggles in the low frequency response are almost certainly room modes: for instance, the one at 40 Hz correponds to a half wavelength of 4.25 metres, pretty much the width of my living room, while the deep cancellation at 150 Hz is probably something to do with the reflection from the wall behind the speakers (a quarter wavelength is 0.56 metres). It did occur to me that I could boost the bass by 3 dB by hooking the mid and treble inputs to the crossover to the 4-ohm outputs of my amps and the bass to the 8-ohm outputs, but then the lower bass is a little boomy already in my room. I have invested a lot of time and effort into this final part of my speaker project, and in many ways I am very pleased with the results. My speakers now complement nicely the character of the rest of my system, which is essentially a natural, unfatiguing sound which doesn't immediately draw attention to itself, but is revealing enough to allow satisfying long-term listening. I no longer feel that the crossover adds an unwanted contribution to the overall sound, which was certainly how I ended up feeling about my original active filter arrangement. The room (along with the need for the speakers to be pushed back to within twenty centimetres or so from the back wall) is undoubtedly a significant limitation for the performance of these speakers. I am sure that the soundstage would blossom much more with more space around the speakers, and the bass would almost certainly sound much cleaner, if thinner. IPL Acoustics, who provided the inductors. Vintage Hi-Fi in Italy, and Tout le Haut-Parleur in France, who supplied the polypropylene caps. Both provided excellent, prompt service. Troels Gravesen's opinion on the question of active versus passive crossovers. Here is the thread I posted on the Multi-way Speaker DIY Forum on this project. An excellent (though to date incomplete) article on calculating coil inductance by David Knight. I submitted a query to the Multi-way Speaker DIY Forum on the LF impedance rise of the HM210Z0: here are the mostly interesting and helpful replies I got. ... and a previous thread on the same subject. Sigfied Linkwitz's modification to the WM-60 for use in audio measurements. A thread I started on the DIYAudio forum about my frequency measurements.